If you happen to own a Samsung Galaxy Chat, then it’s time for you to check your updates as soon you’ll be part of the Jelly Bean arena. 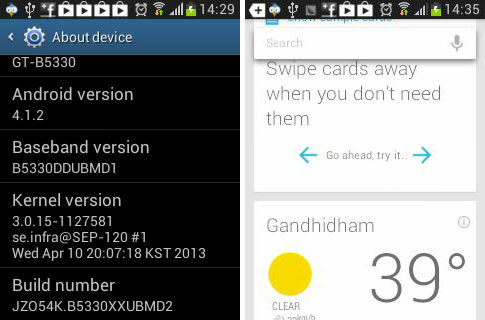 According to the tip we received, Samsung Galaxy Chat has received the Android 4.1.2 Jelly Bean update with base firmware B5330XXUBMD2. The update is approximately 322 MB in size and requires a Wi-Fi connection. The Samsung Galaxy Chat is famous for its QWERTY keyboard and came preloaded with the Android ICS. The Android 4.1.2 update for Galaxy Chat is a major update over the ICS software and brings a host of new features such as Google Now, smoother and faster user interface (UI), enhanced notification panel with editable toggle shortcuts. The Android 4.1.2 update is available both, via Over-The-Air (OTA) and through the Samsung Kies. So if you own a Samsung Galaxy Chat, check and see if you have received the update. Thanks Darshit for the tip!